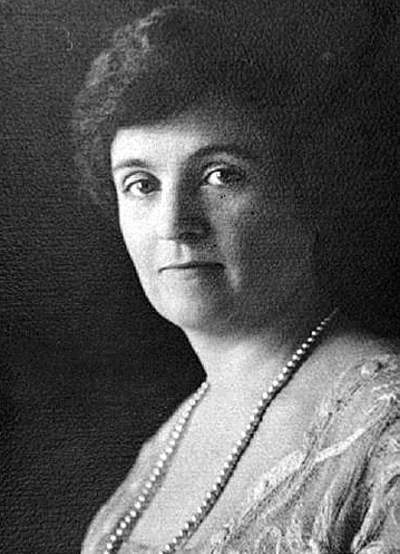 Marie Ogden led a socialite’s life in New Jersey before her husband died in 1929. Devastated by his death, she experimented with a variety of religious beliefs then formed her own spiritual colony and moved to Dry Valley, Utah, where she felt her followers would be safe from coming floods and earthquakes. 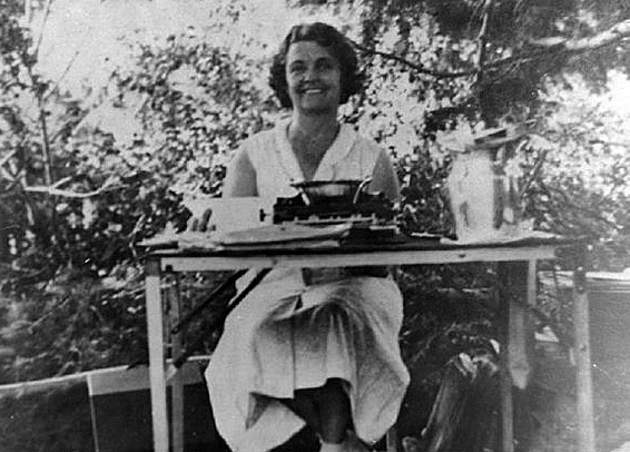 A young Marie Ogden sits with her typewriter. She claimed to get direct messages from God when she began to type. In the 1930s, she bought The San Juan Record, the only newspaper in San Juan County, Utah, to further her religious teachings by publishing her beliefs. 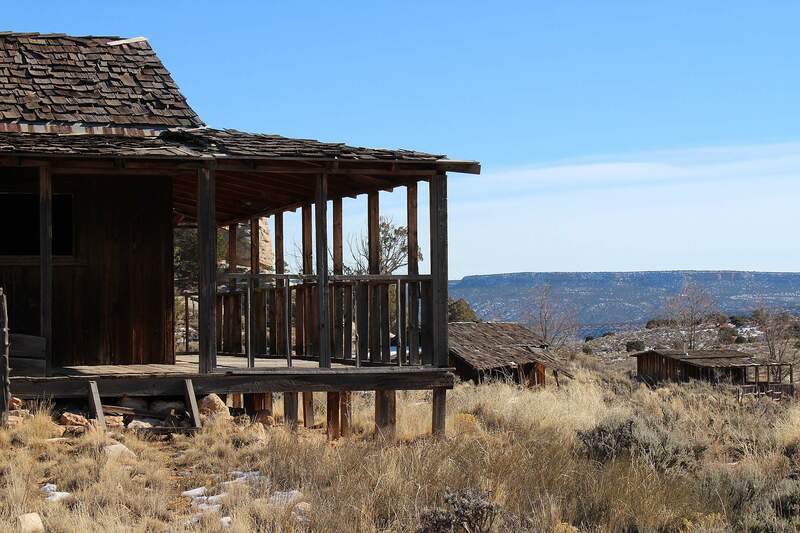 The cookhouse at the Outer Portal, near U.S. Highway 191 and the road to Moab, is on private property. Marie Ogden taught that Jesus would descend for the second coming at Church Rock, which can be seen across the highway. A sandy road leads up to Marie’s house at the Home of Truth. She called her compound the Inner Portal and her home, the largest one there, features a wrap-around porch to the east, west and south and uninterrupted views of Dry Valley and the Blue Mountains. 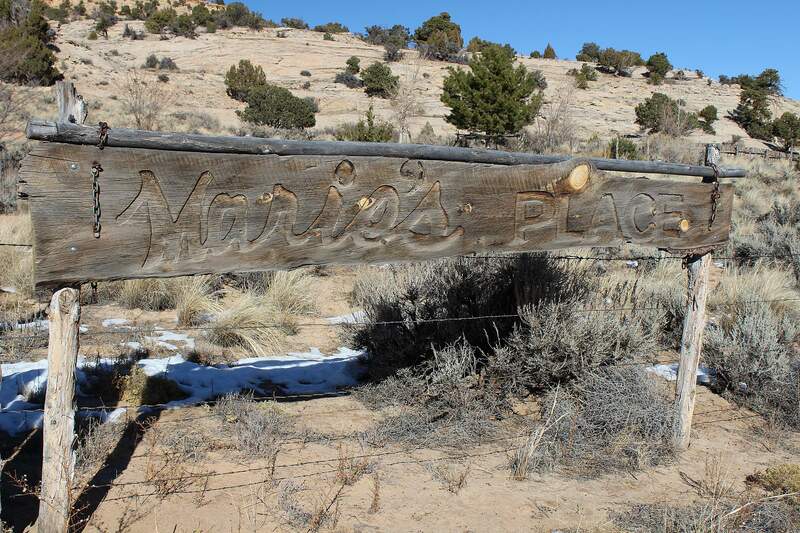 Marie’s Place is a handmade wooden sign at the entrance to half a dozen cabins and original buildings that were part of the Home of Truth religious commune. All structures are on private property. A sandy road leads up to Marie Ogden’s house at the Home of Truth. The house, like all the others, was built with simple frame lumber, had no insulation and no dry wall. 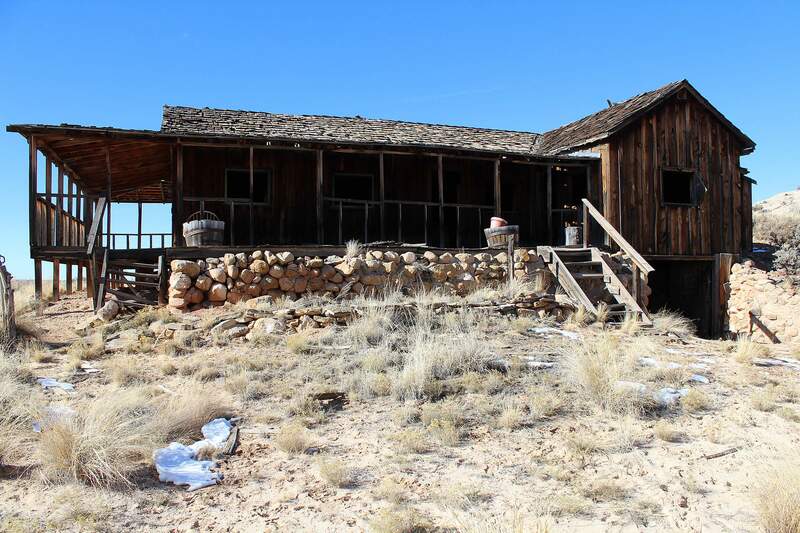 The cookhouse at the Outer Portal, which is near U.S. Highway 191 and the road to Moab, is on private property. Marie Ogden taught that Jesus would descend for the second coming at Church Rock, which can be seen across the highway. A sandy road leads up to Marie Ogden’s house at the Home of Truth. She called her compound the Inner Portal and her home, the largest one there, features a wrap-around porch to the east, west and south and uninterrupted views of Dry Valley and the Blue Mountains. Marie Ogden called her compound the Inner Portal and her home, the largest one there, features a wrap-around porch to the east, west and south and uninterrupted views of Dry Valley and the Blue Mountains. The house, like all the others, was built with simple frame lumber, had no insulation and no dry wall. The cabins are on private property. 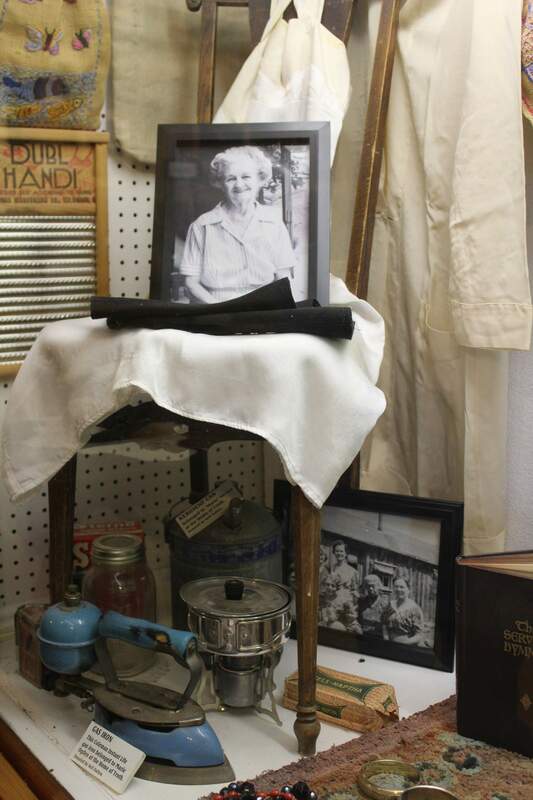 An older Marie Ogden who lead a religious commune in Dry Valley, Utah, north of Monticello, looks out from a display case of objects used at The Home of Truth. On display are an iron, washboard, soap and cooking utensils. The exhibit is at the Southeast Utah Welcome Center in Monticello. 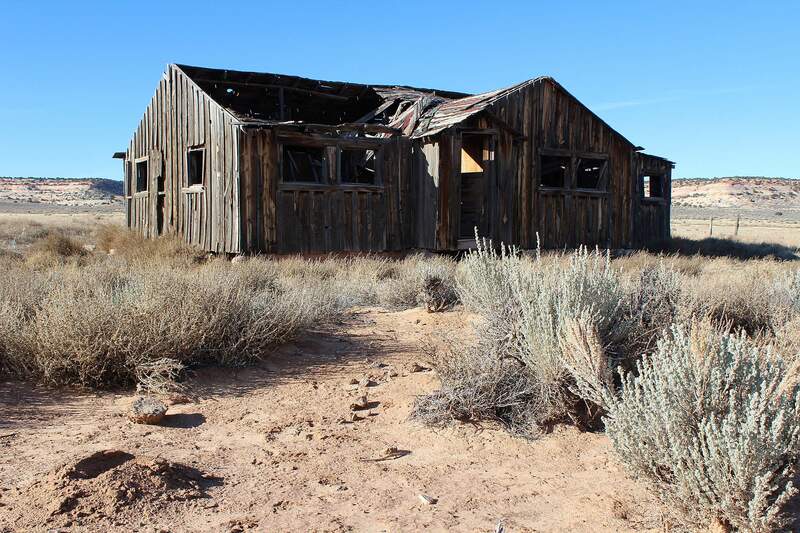 In 1933, in the depths of the Great Depression, 49-year-old Marie Ogden, a spiritualist and millennial Christian, moved to Dry Valley in San Juan County, Utah, to establish a religious colony and to await the end of the world. Two years later when one of the commune’s members died, Ogden claimed the body was going through a transformation and left it unburied, with attendants daily bathing the corpse. The body became mummified because in Utah, in the 1930s, there was no law about burying the dead. The story made national headlines in the Chicago Tribune, Los Angeles Times, Milwaukee Journal and Idaho Statesman. San Juan County is the largest county in Utah, just smaller than the state of Massachusetts. In 1942, there were only 40 miles of paved road. Even today, there are only two stoplights in the entire county. One is a full, four-way stop; at the other, the light just blinks. The county was settled by Mormons, devout followers of the Church of Jesus Christ of Latter-Day Saints, and residents tolerated eccentricity and also believed in divine revelation and the kind of prophecy espoused by Marie Ogden. Mormons generally received their revelations direct from the Lord. Ogden got hers daily from her typewriter as she sat down at her desk. HHHA former socialite and widow from Newark, New Jersey, Ogden had been married to Harry Ogden, a successful insurance executive. During World War I, she raised funds for the Red Cross and later became president of the Federated Women’s Club of New Jersey. When her husband died in 1929, she and her daughter despaired. During her deep grief and soul searching, Ogden studied numerology, astrology, spiritualism, theosophism and wrote 60 religious tracts with titles such as Messages of the Dawn, Wisdom and Truth. “She established reading societies, study groups, spiritual soul-fights. She toured the country lecturing. The messages which came to her typewriter eventually told her to seek out the spot where the Kingdom should be built,” wrote Wallace Stegner in Mormon Country. “Obedience, communistic living, direct revelation, personal abstemiousness and intense religious conviction, flight from the world and sanctuary in the desert, were an old story,” he added. Ogden’s followers had to give her their property, abstain from all meat and eat only fish and vegetables. There was no alcohol, tobacco or coffee. 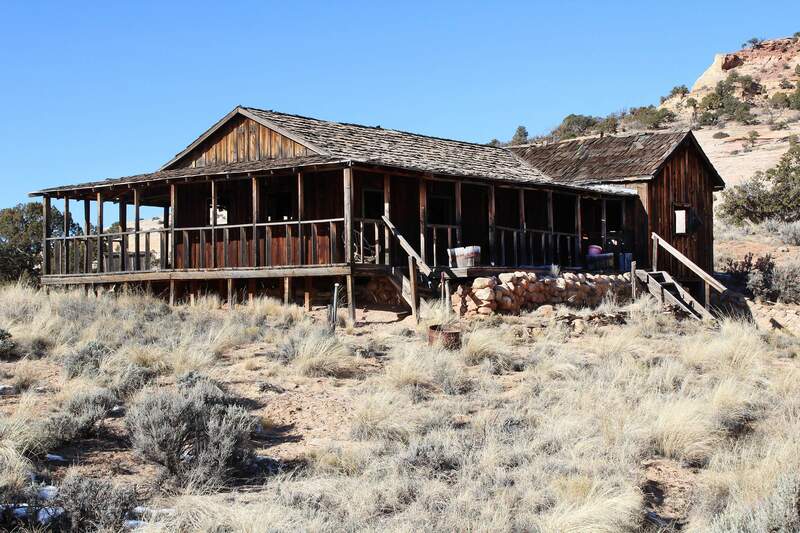 The 100 or so believers lived on open range in a world of sagebrush, red sand, red rocks, cactus and low cliffs. 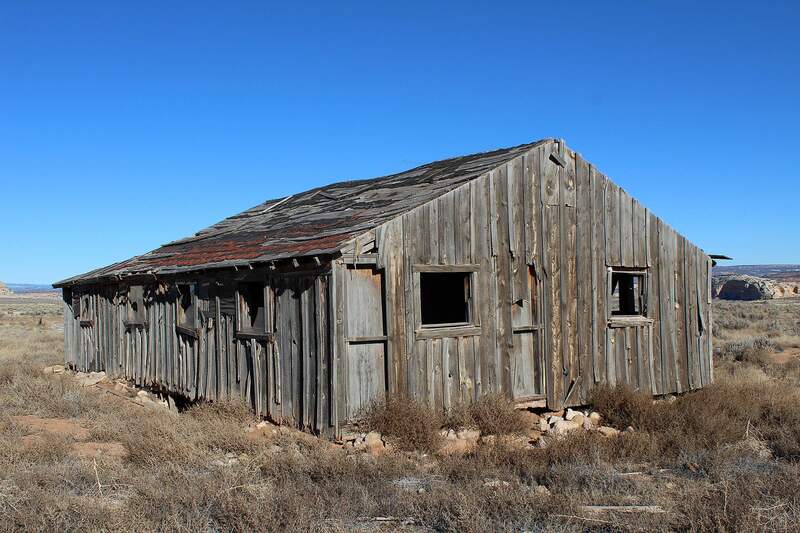 Various articles have been written about Ogden and the Home of Truth in Blue Mountain Shadows: The Magazine of San Juan County History, published by the San Juan County Historical Society. In 2009, Stanley J. Thayne finished his master’s thesis at Brigham Young University-Provo titled The Home of Truth: The Metaphysical World of Marie Ogden, successfully placing her and her followers in the larger context of American millennial religious movements and calling her one of the first of the “New Age” religious practitioners. HHHOgden rejected all forms of materialism. She raised followers from Boise, Idaho, and moved them to a colony 14 miles from Monticello along County Road 211 that is now the entrance to the Needles District of Canyonlands National Park and the popular rock climbing area known as Indian Creek. Her followers tried mining, farming and gardening, but they also went hungry, worked for wages with local families and ran San Juan County’s only newspaper, The San Juan Record, which Ogden had purchased. Historians know much about her because she published accounts of her beliefs in the newspaper and also printed religious pamphlets. Commune carpenters built simple board-and-batten buildings in places called the Outer, Middle and Inner portals. 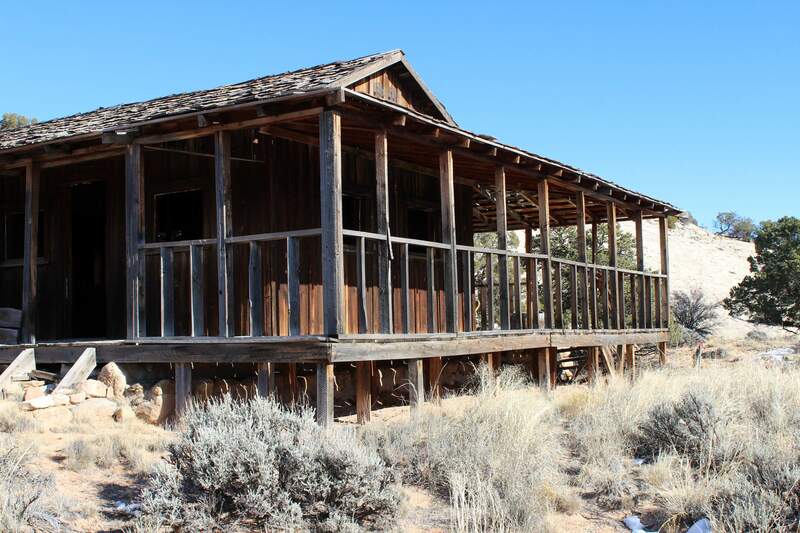 The structures had no insulation, only tar paper in the bedrooms. I knew I had to photograph what was left. Like the Ogdenites, I am also drawn to deserts for the simplicity, the clarity, the bright stars at night. “To the deserts go prophets and hermits; through deserts go pilgrims and exiles. Here, the leaders of the great religions have sought the therapeutic and spiritual values of retreat, not to escape but to find reality,” wrote Paul Shepard in Man in the Landscape. HHHOgden’s followers wanted to be left alone, but publicity over the unburied corpse swirled with headlines like “Strange Cult in Desert Trying to Bring Dead Woman to Life,” from the Milwaukee Journal, and “Strange Cult Would Bring Back Life” in the Reno Evening Gazette. San Juan County Sheriff Lawrence Palmer visited and was turned back. Physician I.W. Allen came with nurses and determined the body of Mrs. Edith Peshak was not a health hazard. Twice daily the corpse received a salt bath and a milk enema. Eventually, the state of Utah demanded a death certificate. The woman’s son, Frank Peshak, arrived. “He saw his mother’s body, blue-black, mummified, shrunken, and shouted hysterically that he would take it and bury it immediately. For some reason, he did not, perhaps because his father was still a cult member, still clinging to the hope that his wife would be restored, and perhaps because the nurses’ report had to say in truth that the mummy was not a menace to health,” Stegner wrote. Secretly, in the dead of night, Ogden finally had Mrs. Peshak cremated on a bower of cedar, pine and juniper 4 feet wide, 4 feet high and 7 feet long. The adverse publicity of caring for a corpse diminished followers at the Home of Truth. They drifted away, some to Moab, some to Durango. “Those electing to withdraw from the sect did so completely destitute, into a largely unfamiliar region, at the harshest ebb of the worst depression in the nation’s history,” John F. Moore said. The cult dispersed, but Ogden stayed, dying in a local nursing home a few weeks before turning 93. She is buried with a simple gravestone in the Monticello cemetery. Her articles, diaries and other religious tracts have been displayed at the Monticello Visitor Center.